This book is for every student of Truth. Whatever path you have chosen, it will give you an understanding of the true meaning of mastery. 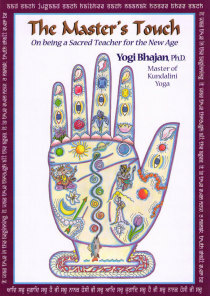 The book contains the transcripts of the first 2 lecture series, for teachers of Kundalini Yoga, given summer of 1996 and spring of 1997. It is wealth of knowledge about what it means to serve humanity as a teacher. The hand on the cover is the hand of protection, symbolizing the wisdom and strength of a teacher.